Cinchbucks is a get-paid-to and survey site that supposedly gives a lot of earning opportunities. But is Cinchbucks a scam, or is it really a great way to make some extra cash online? I have joined and tested the platform thoroughly myself, and in this Cinchbucks review I will give you all the details about what it really offers, what you can expect, and if it will be worth your time. So let’s find out if it is the right site for you or not! What is Cinchbucks and what does the site offer? Cinchbucks started in 2014, and according to the site itself, it now has more than 1 million members. It is a get-paid-to site (GPT), which means there are several ways you can earn on the site. Let me reveal right away that Cinchbucks is legit, and it is a site where you can actually earn and get paid. That it is legit does however not mean it is necessarily the right site for you, so let’s go over what it offers, so you can find out. 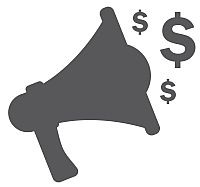 If you have read any other articles or reviews here on PaidFromSurveys.com before, you will know that I think paid surveys are a great way to earn and have your opinion heard at the same time. As most other GPT sites, Cinchbucks offers paid surveys as a way to earn. It offers paid surveys through third party providers, which means they have cooperation with several survey providers, and you will therefore find a good amount of paid surveys here. Exactly how many surveys you find depends on the country you live in. You can always see, before you start a survey, how much you will earn and the estimated time it will take. You can see how much you get before starting a survey. It is great being able to see this before starting, so you can easily see, if it is a survey you want to participate in or not. There is no demand for a certain amount of surveys you have to take to be a member. You can just take as many or as few as you want to. Cinchbucks has a small section, where you can get cashback for certain services you can buy online. At the moment of writing this review there is not a big selection, and it is mostly services related to internet marketing like email services, hosting, etc. Be aware that you have to pay to earn rewards here, so it is not as such a way to earn money. I must admit that I am not impressed with the opportunities in this section. Compared to a site like for example Swagbucks, where you can get cashback on hundreds of regular online shops, it does not offer a lot here. But if there are any of the services you would like anyways, you might as well get a little cashback. Just make sure to read the conditions before taking any offers here, so you know exactly what it takes for you to get your reward and how long it will take, as there usually is a delay for up to several months, before you get your cashback reward. On Cinchbucks you can also find an offerwall section, where you can take paid offers. Cinchbucks offers access to several offerwalls and has a good selection of offers. You can earn by for example signing up for free trials, downloading apps, participating in contests, and more. You can also often find extra surveys you can take on some of the offer walls. It is a section that in my opinion is worth checking out, as you can sometimes find some really great offers and ways to boost your earnings. Not all offers are great though, so make sure to read the conditions for each offer before taking any, so you are sure what you need to do and what the requirements are to get your reward. Sometimes you will get a pop-up with a promo code, when you first enter the Cinchbucks website. This code can then be used to get a joining bonus. 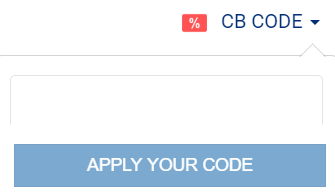 After you sign up, it might not be clear where you need to put this code, but it is at the top of the screen where it says “CB Code”. In my case I got a bonus of 50 points just by doing this – easy money. You find the promo code field at the top of the screen. This is also where you in general have to put Cinchbucks promo codes that you at times can find. According to the site itself these promo codes can appear anywhere on the Cinchbucks website, blog, and social media pages. I have personally only found the joining bonus promo code myself, but if you are regularly on their social media accounts, it can be worth keeping an eye on these codes to get some extra free cash. In addition to this, you get 10 points just by answering a couple of very short questions after joining. You can also earn 50 extra points by filling out your user profile, after you join. This does however depend on the country you live in. In the country I live in, I could not earn this reward, but it is possible in some countries. You can invite friends to join Cinchbucks and then earn extra rewards. If a friend you invite joins, you will earn 10% of everything they earn, once they have earned their first 1000 points. This will not affect the rewards your friend will get, but is something paid by Cinchbucks as a thanks to you for inviting. You will need to know a lot of friends to invite to make any real money like this, but it can still be a nice way to get some extra earnings. You can get paid to watch videos on Cinchbucks. This is the same video option as many other similar sites offer, and if you have read any of my previous reviews, you will know it is not an option I am too excited about. The videos are not the fastest way to earn. It can be entertaining and easy, but it takes a lot of time to make any money by watching these videos. Therefore, it is in my opinion only worth it, if it is videos you want to watch anyways. If it is just to earn, you will get more out of many of the other options on Cinchbucks. Cinchbucks has a section with A LOT of small online games you can play for free. There are games within all kinds of genres. From what I can see and have been able to find out by testing, you will however not get paid to play these games. But there are a lot of entertaining games, so if you like playing games, you can find a lot here. But if you want to earn, you should use some of the other options instead. You can find some coupons that will give a small savings on certain products. It can be savings on products like for example deodorants and sugar. The items are mostly household items, and there are not a huge amount available. Be aware that these coupons cannot be used worldwide, and are mostly relevant if you live in the USA. If you live here, it can be a way to save a few extra dollars, if you can find coupons for products you use. You can get an extension for your Chrome browser called CinchAddon (also sometimes called CinchButton). You can install the CinchAddon extension for Chrome. This means that will automatically get a notification in your browser, when a new survey or offer is available. If you use Chrome, this can be an easy way to make sure not to miss a survey or offer without having to check on the site. As you can see, Cinchbucks has a good amount of opportunities. But how you will get paid is of course also very important to find out, if it is a site for you or not. Cinchbucks has a very good selection of rewards, and you can find a reward almost no matter your preferences. You can for example get paid in cash through PayPal, get paid in Bitcoin, or choose between many gift cards. Personally, I prefer sites that offer PayPal as a payout method, as it is an easy way to get your rewards in cash, so I am happy Cinchbucks offers this. But there are many other great rewards as well, if you prefer other methods. When you take surveys, offers, etc. you earn Cinch Bucks (CB). 1 CB is worth 1 cent, so 100 CB is equivalent of $1. You can request a payout, once you have earned $10. 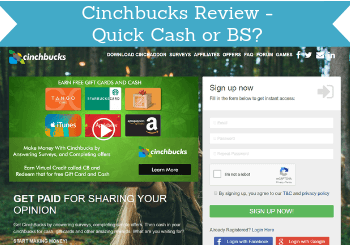 With a little patience to find the surveys you qualify for, and by taking your time to find the good offers, it is possible to make some nice extra cash or rewards on Cinchbucks. You should however see it as a way to make some extra cash on the side, and NOT as a potential way to make a full-time income. If this is your goal, you will be disappointed. But if you go into with the right expectations, it can be a great way to make some extra money, when and where you want to. If you like to take surveys and offers on the go, this is possible with Cinchbucks. It does not have an app, but the website is kind of mobile optimized. What I mean about this is that certain aspects of the site works fine on mobile, but other aspects are not working so well, and the navigation is a bit more difficult than on desktop. Some surveys you will take might also not be optimized for mobile, and in those cases you might have to scroll in and out a bit. 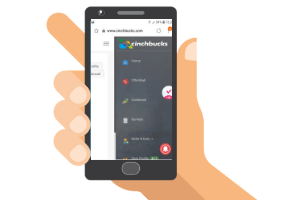 But overall Cinchbucks gives a decent user experience on mobile, and if you take a little time to get to know how to navigate on mobile, it is definitely possible. A great thing about Cinchbucks is that you can join it from most of the world. The only countries you cannot join from are Pakistan, Nigeria, North Korea & 11 other countries blocked by PayPal. You can join from all other countries. The amount of opportunities will however depend on the country you live in. But it has a good amount of opportunities for many countries. In addition to Cinchbucks it can however be worth also checking out the list of the best paid survey and GPT sites in your country, as it will increase you chances of earning, if you join more sites. If you need help with any issues with your Cinchbucks account, the website has a fairly big section with FAQ, where you can find answers for the most common questions. After you log in, you can also submit a ticket, if you need further help. If you are not a member, Cinchbucks also has a support email you can write (support[@]cinchbucks.com). I have been in contact with support a couple of times, and I have received a quick reply, so I personally have good experiences with the support there. Cinchbucks is NOT a scam but a legit site, where you can earn some extra money. This does however not mean it is the right option for everyone. So let’s finish this review by summing up the pros and cons, so you can get a better overview and see, if it is for you or not. Overall, Cinchbucks has a good amount of opportunities to earn, and it is definitely a site, where you can earn some extra cash. It can take a little patience to find the surveys you qualify for, and you have to be aware in the cashback section, so you do not end up saying yes to conditions you are not aware of. But the site is fairly easy to use (even though on mobile it is not as easy), it has a fairly low payout threshold, good reward options, and is available in most countries, so it can definitely be worth considering. If you want to sign up for Cinchbucks, it is very easy and fast to do. Just click the link below that will take you to the sign-up page. Here you just need to fill out your email and a few other questions (takes less than 30 seconds), and then you are a member and can start earning. If you have any comments, questions, or have any experiences with Cinchbucks yourself, I would love to hear from you in a comment below. Cinchbucks is a legit get-paid-to site with a good amount of opportunities to earn. At times it can take a bit of patience to find the surveys you qualify for and to find the good offers. Overall it however offers good opportunities, it has a decent payout threshold, great reward options, and it is available in most of the world. Cinchbucks gives me a chance to earn a little cash while watching informational videos, taking surveys in my spare time. I would recommend it to anyone who has the time to spend. Excellent for retirees who are looking for an additional activity and like a little spending money to boot. Thanks for sharing your experiences Maria. Great to hear. Hey Mikael, nice article. I feel that it has given me another money making avenue as far as PTC and surveys; I like that there are multiple ways to earn on the site. I have to admit that surveys are a good way to earn a little extra money if you’re feeling strapped or feeling like you need a little change to get a snack cake or two. Good job! Glad to hear you liked the review. Thanks for the information about Cinchbucks. It looks like it might be worth trying out. One thing I don’t understand though is why some sites have things you can do that do not earn you anything, like playing games. They know we are there to earn money. Maybe they think it will it something we will do to give us a break from the surveys? It is a good question Tom. I also do not use the options that do not pay and get-paid-to sites. But I guess it might be because many people like to play games, so they give them the option to do it on the platform when they are there, and give them another reason to come back, if they give them a good selection. Cinchbucks is a great site to earn some extra cash. As you told, it’s not a site that will make you rich, nor the money that you will earn there are enough to make a living, but, if you have some spare time, why not to use in sites like Cinchbucks? Everyone wants some extra money, even a small amount sometimes can make a difference. Exactly Leo. It is a great way to make a little extra cash when it fits into your schedule, as long as you do it with the right expectations. I completely agree. If you are asking if Cinchbucks pays out in Bitcoin, then yes. You can get paid out to your Bitcoin wallet once you have earned $10.